Willy Vlautin has never written a cheerful book in his brilliant writing career and Don’t Skip Out on Me is no exception. Young Horace Hopper, half-Paiute, half-Irish, wants to be a championship boxer. Abandoned by his birth parents, he’s been taken in by an elderly rancher and his wife who love him like a son. They would like nothing better than to have him take over their Nevada ranch. His desire to prove himself in the ring, however, is stronger than his sense of worthiness. The ranch isn’t something he thinks he deserves. In fact, he doesn’t think he deserves much of anything out of life. Your heart will break for Horace as he tries to make his way in the world and you’ll find yourself pulling for him, hoping that he discovers his worth. From Willy Vlautin, award-winning author of Lean on Pete and The Motel Life, comes a powerful exploration of identity and loneliness pulled from deep within America's soul. A beautiful, wrenching portrait of a downtrodden man, Don’t Skip Out on Me narrates the struggle to find one's place in a vast and lonely world with profound tenderness, and will make you consider those around you—and yourself—differently. Willy Vlautin is the author of The Free, Lean on Pete, Northline, The Motel Life, and Don't Skip Out on Me. He is the singer and songwriter of the band Richmond Fontaine and a member of the band The Delines. He lives outside Portland, Oregon. 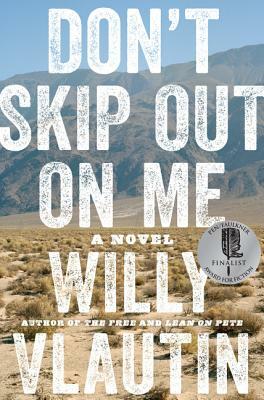 “Willy’s novel Lean on Pete was one of my favorite reads of the last decade. I might love The Free even more. ‘Cinematic minimalism’ in the grand tradition of Fat City, Ironweed, and the works of the great Raymond Carver.